Do you struggle with getting the perfect fit, even though you have a dress form in your size? You’re not alone. As if it weren’t bad enough that the fashion industry tries to stuff us all into 10 measly different sizes. We can’t even fit our own clothes on a dummy that’s shaped just right. Even adjustable models can’t always get a perfect fit without a little help. As any seamstress knows, just because the size is right doesn’t mean the shape is right, especially for us curvy gals with generous bust and hips. So, we cut up foam and tape it on, trying to get just the right shape. It’s messy, and not great if we have to keep changing sizes to sew for clients. Well this handy little system makes getting a perfect fit really easy. The system comes with a variety of anatomically shaped pads and two stretchy covers to hold the pads in place. All you have to is slip the cover over your dress form and then slide the pads in place until you get the perfect silouette. That’s it! Piece of cake. 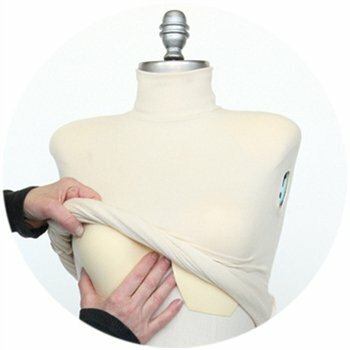 Although Fabulous Fit does sell their own dress dummies, the system works on any brand or model, including Dritz, Uniquely You, Singer, PGM and the rest. Anyone who has a hard time fitting themselves. Anyone who doesn’t want to do multiple fittings when sewing for others. Anyone who changes sizes now and then. Professionals who want to look like a genius to their clients. Could you use a little extra help getting a perfect fit? I know these little babies are going on a hook right next to my fitting area, so they’re always within reach. It usually has the best price on these dress form pads. And I know for me, it’s a small price to pay for easy, happy fittings every time.